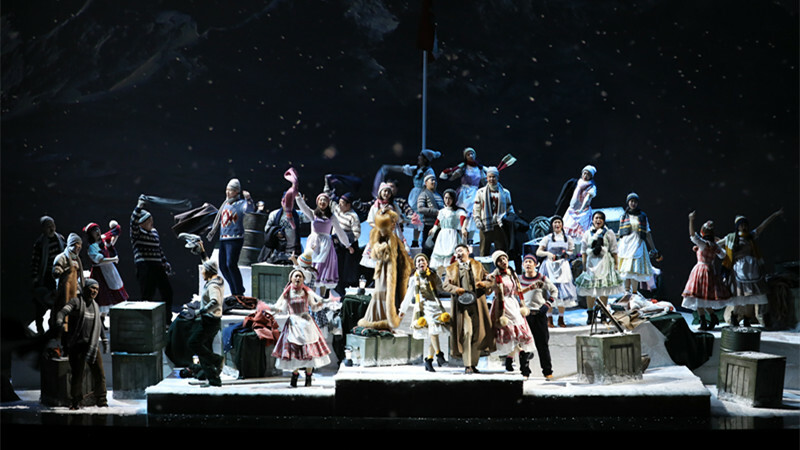 On the evening of March 14th, the NCPA (National Centre for the Performing Arts) -produced Opera La Fille du Régiment premiered on stage. conductor Matteo Beltrami, along with the China NCPA Orchestra, China NCPA Chorus and singers including Sabina Puértolas, SHI Yijie, Giovanni Romeo, Doris Lamprecht, Daniela Mazzuccato, WANG Hexiang, ZHAO Denghui and MEN Hongduo, etc., delivered a splendid performance. The story unfolds in the mountainous area of Tyrol, dubbed, “heart of Alps.” The overture began with the feeble sound of a horn, sounding as the first wisp of sunlight shining in. Following a light woodwind, string music flowed in naturally, creating a gentle and tranquil atmosphere. In order to break the limitation of narrative in the opera, director Pier Francesco Maestrini and his creative team, instead of using a traditional method for the prelude, he played a special recorded video. 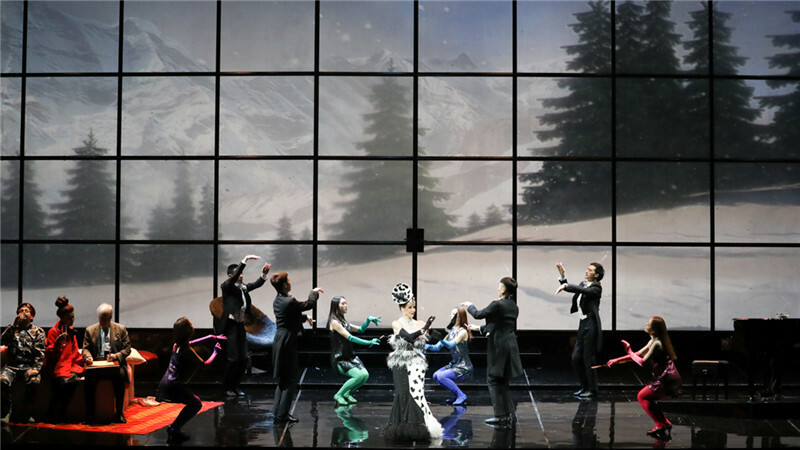 As the overture streamed out, the grand and beautiful snowscape of Tyrol burst out into view from the large screen. Following an appearance of the protagonists Marie, Tonio, Sulpice and La Marquise de Berkenfield, etc., the character relations and antecedent of the story were spelled out: the orphan Marie is adopted by French Army Sergeant Sulpice and raised in the army. Once Marie is saved from the edge of a cliff by a local young man Tonio, she falls in love with him. If narrated in a conventional way, the background of the story may confuse the audience. The design of the video stems from a thorough consideration of the audience. 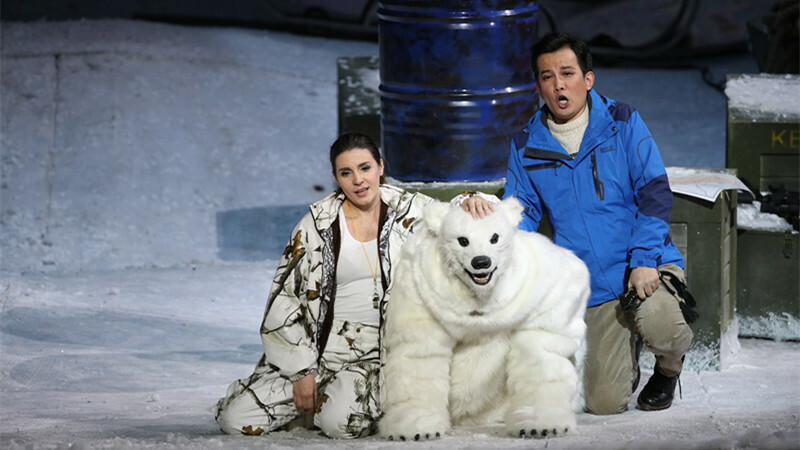 In the video, singers’ exaggerate and absurd performing style, while catching the audience’ eyes and bringing them into the play from the beginning, forming a comedic base for the whole play. 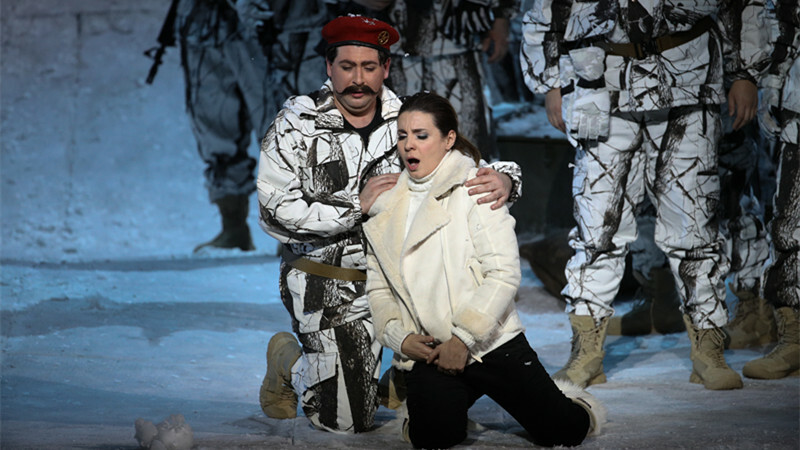 In the first act, Marie came on stage singing happily Au bruit de la guerre. Facing a highly-challenging decorative piece in the ending part of the aria, the soprano Sabina Puértolas finished beautifully. 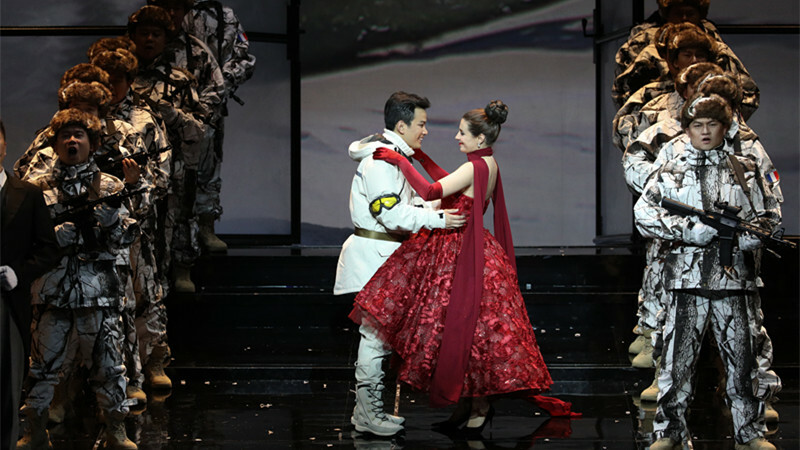 Then a duet was performed by Marie and Sulpice, and baritone Giovanni Romeo interpreted in an interesting way about a strict but daughter-loving father, conveying the love between father and daughter. Tonio, performed by SHI Yijie, joined the No. 21 Army for his beloved Marie. As the people approved his proposal, Tonio cheered with overwhelming joy: “Jour prospère! 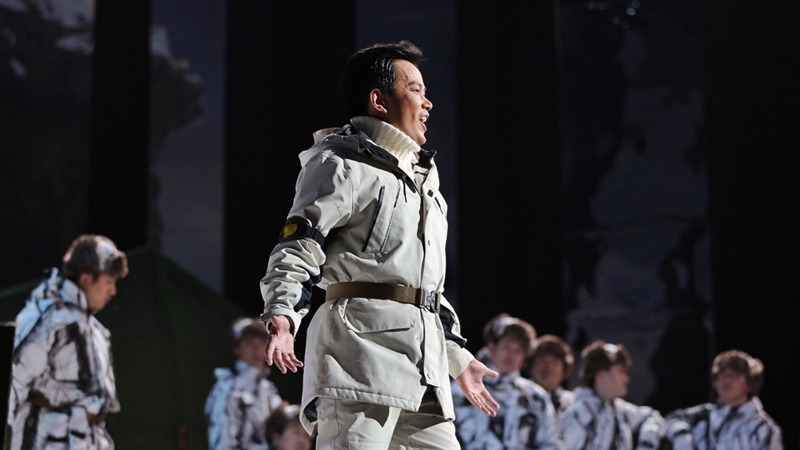 Me voice Militaire et mari!” With all emotions devoted to singing, SHI poured out the nine world-renowned high Cs lightly and sonorously, sending out a strong penetrating power. The aria was concluded in the audience’s prolonged applause. SHI swiped his sweat and gave a sign to the conductor for an encore. Unexpectedly, he extended it into TEN this time! The marvelous tenor received continuous ovations and cheers after his encore. In the second act, Marie’s aria Le Jour Naissait Dans Le Bocage was a brilliant humorous part. Trapped in a boudoir, Marie was too bored to learn old-fashioned romantic songs, thus she was either off key on purpose or squeezed out sharp high pitches, making the audience laugh occasionally. This part embodies the humorous factor in the comedic opera, and inundated with superb coloratura techniques of Donizetti’s bel canto opera. When all people gone, the stage was left with Marie alone. Under the background of a cello, Marie, in a solitary and helpless melancholy, sang a gloomy aria C'en Est Donc Fait, En Mon Sort Va Changer… She took off her high-heeled shoes, revealing a girl’s vulnerable side in the desolate and beautiful melody. As the light dimmed, a beam of cold and dazzling white light shot Marie, causing sorrow in the audience’s hearts. Despite the humorous air permeating the comedic opera, touching points are also included, such as the kindness embedded the humanity of all roles. The foster fathers’ love for the daughter, the mother’s move to break the noble’s code of ethics for the daughter’s happiness, the pure love and simple friendship among soliders, all strike people’s heartstrings. On March15th-18th, another group of singers including GUO Chengcheng, Pietro Adaíni and LIU Songhu, etc. will also deliver touching performances. 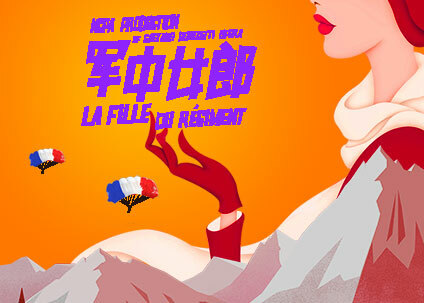 The NCPA production of Donizetti’s comic opera La Fille du Régiment is set to dazzle audiences on March 14th-18th in the Theatre. Following L’Elisird’Amore and Don Pasquale, stage director Pier Francesco Maestrini starts his third collaboration with the NCPA in Donizetti's comic opera.